It gives clear information to your dog. The sound of the click means one thing: a reward is coming because of what you did when you heard the click. Unlike our voices, which can say the same word in different ways, and so express different emotions or meanings each time, the click sounds every time it is heard; its meaning never varies. Helping dogs learn and succeed step by step. Encouraging dogs to think more for themselves. Understanding dogs' feelings from their body language. "So Now What Do We Do"
Baskerville Ultra Muzzle. Your dog can eat treats while wearing this. 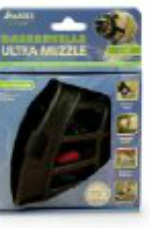 See video to your right to train the muzzle to your dog. Cut up in pea size pieces.